I’m president of the Desert Foothills Astronomy Club. Not surprisingly, I get lots of email from people who just got their first telescope and can’t figure out how to use it. Everyone knows how to use binoculars: take off the lens caps, focus, enjoy. But telescopes are admittedly more difficult. Over the years, helping hundreds of people, I’ve compiled a sizable collection of tech-support horror stories. They aren’t quite as horrible as these, but they’re similar. As with computers, the majority of telescope problems are caused by user inexperience — not by faulty equipment. I’ll share a typical example here. Names have been omitted to spare the owner any further embarrassment. I shot the photo above while doing a “house call” for one new telescope owner. He purchased this scope at a thrift store, didn’t know if it was even functional, and had no owners manual. He claimed he tried, but “couldn’t see anything but black” with this scope. 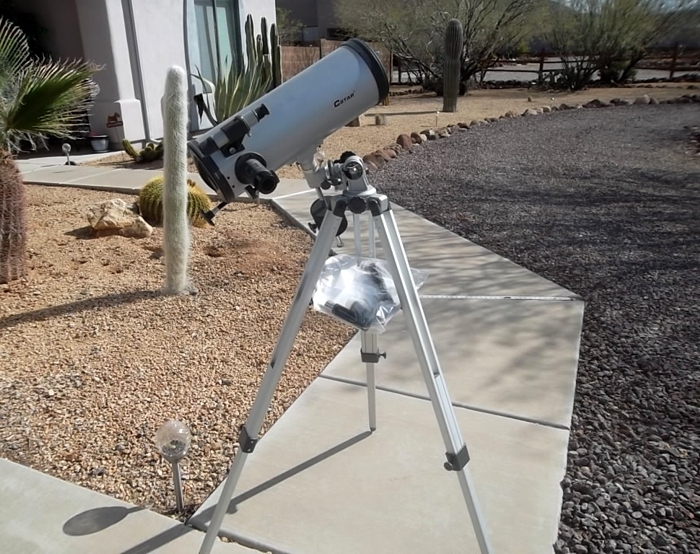 Experienced scope users will spot several problems: the wrong end of the scope is pointed at the sky, the protective “lens caps” are still in place, and the polar axis is pointed toward the ground. After a couple hours of adjustment and instruction we had the scope working. He called me later in the evening to report that he was “looking at the Moon and thrilled with the view.” Not all my house calls are that successful. But if you have a new scope, and need some help, please read on. Set up and test on a level surface in a comfortable location. You can move the scope later for actual use. Mount the telescope tube onto its tripod or base, if either is provided. If your telescope has a motor, leave it unplugged for now. Level the base using the (usually) built-in bubble level. For equatorial mounts, set the polar axis (later to be aligned with the North Star) to your latitude angle. Remove the protective caps/covers from the main telescope tube, eyepiece holder, and (if included) finder scope. Note that finder scopes often have caps covering both ends. Select the lowest-power eyepiece provided. That’s the one with the highest number on its label (typically 26 mm or 32 mm). Remove any caps (again, check both ends), and insert the eyepiece into the eyepiece holder. Tighten the holder set screw so the eyepiece doesn’t fall out. Release the clutch(es) so that you can easily move the telescope tube with your hands. Point the telescope at a distant terrestrial target while watching through the finder scope (or eyepiece). Distant mountains or towers make good targets. The view will be blurry at this point, but good enough to see when you’ve got the target centered. Re-engage the clutch(es) to ensure the telescope remains on target. If you wear astigmatism-correcting eyeglasses, keep them on. Otherwise remove them. Adjust the focus until you see a clear and sharp image in the eyepiece. Align the finder scope to show the same target you see in the eyepiece. That’s it for now. Replace the caps/covers and leave the telescope until evening. When ready to observe, move the scope to an area where you have an unobstructed view of the sky, check that it’s still level, remove the protective caps/covers, and (for equatorial models) align the polar axis with the North Star. That was just the setup. Operating the telescope and finding things in the sky are the next steps, and both again depend on the type of telescope and how you intend to use it. But now that you’ve at least got it set up properly, you might be able to wing it from here. If you’re still having problems, keep reading. But first, a requisite warning for beginners: NEVER point your telescope at the Sun without a properly rated filter. If your scope came with anything labeled “solar filter” or “sun filter,” have it checked out by a knowledgeable amateur before use. Otherwise, viewing the Sun through a telescope can cause permanent damage to your vision. You might be confused by the terminology in this post, and need to expand your vocabulary. If your telescope came with a manual, take the time to read it and learn your way around the instrument. If you have no manual, they’re almost always available online. Search for “manual + [telescope model number]”. Your local local astronomy club can also be of assistance. Astronomy clubs are always eager to introduce beginners to their hobby. Just search for “[your city’s name] + astronomy club”. For self-learners, there’s a wealth of information online as can be seen by these search results. It pains me that so many telescopes end up gathering dust in a closet, or are given away to a thrift store. Owners rarely take the time to learn how to use their scope, and they miss out on what it can provide. Maybe it’s just a lack of patience. Maybe it’s that the “big box” stores are flooded with junk telescopes that just don’t perform as advertised — if that’s where you got your scope, my condolences. Take a look at my April 5, 2006 post for more on that topic. If you don’t yet have a scope, and are thinking about getting one, your safest choice is to order it online. Stay away from used scopes. A search for “best + first + telescope” will provide many good leads. And as always, if you still have any questions, send me an email and I’ll do what I can to help.